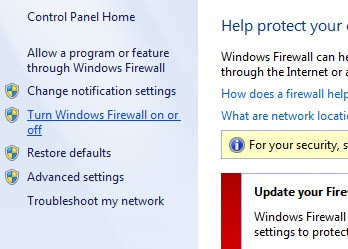 In Windows 7, firewall can be turned on/off as described below. Open ‘Windows Firewall‘ by running the command ‘firewall.cpl‘ from Run. Domain Network location settings: This controls the firewall behavior if you are connected to a domain network. Private Network settings: This controls the firewall behavior when you are using a private connection, for example, your home network connection. Public Network settings: This one controls firewall operation when you are using public network such as at airports, hotels. For all three networks, it’s recommended to turn on the firewall always.